A wedding is arguably one of the biggest parties a couple will have in their lifetimes. With such an important milestone being reached, it only makes sense to make it memorable. Dancing is an integral part of a wedding, starting with the new bride & groom who traditionally dance a waltz before anyone else at the reception. Not a dancer? Have no idea where to start? Don’t worry! That is where Dancesport Academy in Ardmore, PA comes in! One of the best studios on the Mainline, our staff has years of experience helping people learn the skills to make their wedding dance memorable. 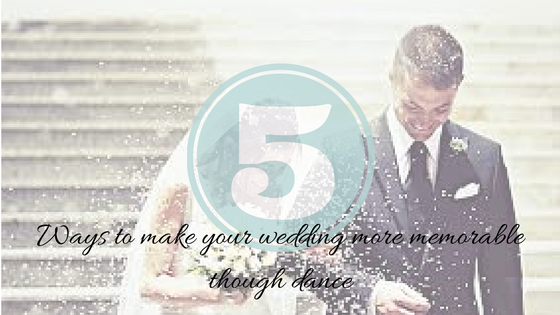 To get you started, here are 5 ways to bring dance into your wedding. The first dance, one of the most iconic traditions at a wedding. Whether you are looking for intricate choreography or just want to know enough to get by, Dancesport Academy can help. Not into waltz music? No problem, couples dance to everything from high-energy swing, big band foxtrot, as well as pop and rock songs of today. The sky is truly the limit! Some couples even combine different styles of music and/or dance to make it more fun. Group dance. Get your bridal party involved! Want to create a fun and entertaining entrance into the reception? Have your bridesmaids and/or groomsmen come to Dancesport to learn a choreographed number. Mother/Son & Father/Daughter dance. Nothing could be sweeter than including your parents into the dancing at your wedding. Make an entrance. Instead of merely walking into the reception, DANCE your way in! Pick a fun song that expresses the mood of your wedding and learn to dance to it as you make your entrance! Curate your music list. Whether you are hiring a band or a DJ, make sure to include music that is fun and gets people off their chairs and on to the dance floor! Swing, big band, rock, and top 40 pop music can all be danced to. Don’t forget to include a few throwbacks for the older generation that will be attending. As the premier ballroom dance studio on the Mainline, whether you are looking for your first dance, general social dancing or a special choreographed bridal party dance, we can help.